To start, I’d like to push back against the idea that New York’s health care system is “under attack” from the federal government. The chance that Congress will repeal the Affordable Care Act or cut spending on Medicaid all but disappeared with the change in party control of the House of Representatives. New York does face the potential loss of about $1.2 billion in federal matching funds under the Disproportionate Share Hospital program. However, those cuts – originally enacted as part of the ACA in 2010 – have been repeatedly postponed by Congress and might well be again this year. The possibility of DSH cuts aside, New York’s federal funding for health care is going up, not down. As discussed below, this action undermines the proper separation of powers in state government and flies in the face of transparency and accountability in handling public funds. The overstated threat from Washington was no justification for imprudent decisions last year, and should not be used as such this year. That said, the Legislature should prepare for the possible loss of DSH funding. At a minimum, it should make sure that what DSH money the state does receive is properly spent on its intended purpose – that is, reimbursing hospitals for the losses they sustain in treating the poor and uninsured. That is not the case as things now stand. Last year, the governor established a task force within the Health Department to reform this program. But the department has yet to come back with a report, and the governor’s budget disappointingly takes no action. Another flaw in the state’s DSH system assures that all or most of any cuts will accrue to New York City’s publicly owned hospitals, which provide the bulk of charity care in the metropolitan area and are heavily dependent on city and state subsidies. If DSH cuts materialize, true safety-net hospitals should be the last to suffer a loss of funds, not the first. My next topic is Medicaid. The program is better managed now than it was eight years ago, but it remains large and costly by most measures – and as of 2016 ranked No. 1 among the 50 states in terms of per capita spending. Moreover, the Medicaid efficiency gains achieved in recent years show worrying signs of eroding now. In a program this large – due to cost $79 billion in fiscal year 2020 – even a small amount of waste or mismanagement can translate to a significant burden on state finances. Among the important reforms in the governor’s first term were the abolition of “trend factors” that automatically boosted reimbursement rates on an annual basis, the imposition of a “global cap” on state Medicaid spending (tied to a rolling average of the medical inflation rate), the appointment of a Medicaid Redesign Team to identify money-saving ideas, a shift of more patients to managed care, and the empowerment of the health commissioner to cut Medicaid fees as necessary to live within the cap. Here is the cause for concern: Per-recipient spending, after bottoming out in 2015, has climbed steadily since. This is because the inflation-based cap was dramatically more stringent during the period of rapid enrollment growth – as the state experienced with the advent of the Affordable Care Act in 2014 – but imposed relatively little restraint after enrollment flattened after 2015. Plus, the Cuomo administration has significantly weakened the cap’s effectiveness by exempting an ever-growing share of Medicaid spending from its limits on growth. The main factor driving this increase appears to be the minimum wage hike enacted in 2016, which lifted the pay floor to $15 for New York City employers of 11 or more as of New Year’s Eve. 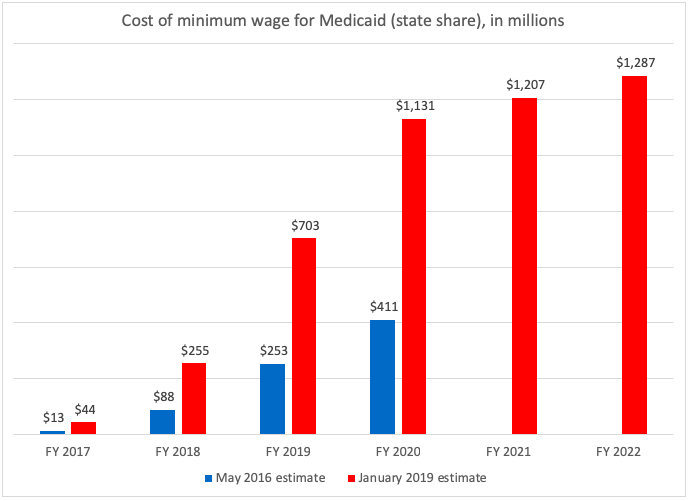 Medicaid-funded portions of the health-care system employed large numbers of people at or below the current minimum wage, and the state has agreed to reimburse providers for the additional cost of meeting the mandate. Lawmakers should keep those unexpectedly high numbers in mind before contemplating further increases in the minimum wage. It’s understandable that providers would seek additional compensation to absorb state-imposed expenses of that magnitude. But there is little argument for exempting such a cost from the global cap. Labor is a core part of health-care delivery, and a cost-control mechanism that exempts such a large portion of labor spending is doomed to irrelevance. 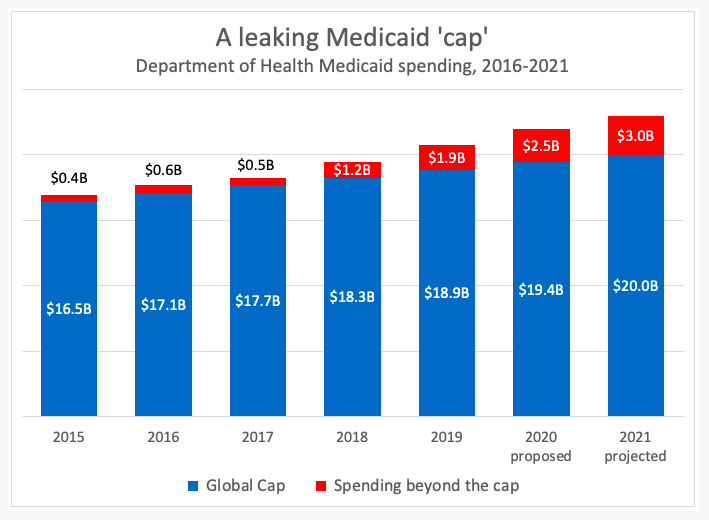 Extending the global cap as-is through fiscal year 2021, as the executive budget proposes, would actually give Medicaid a license to grow faster than the overall budget, which the governor tries to keep at 2 percent. 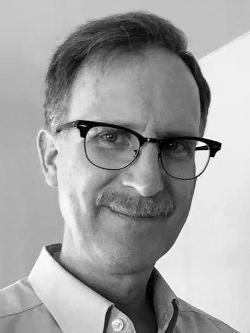 To serve its original purpose of driving efficiency, the cap should be restructured in two ways: It should cover all Medicaid spending, not just the DOH portion, and it should be set significantly lower than the inflation rate, with an explicit goal of bringing per-recipient spending rates more in line with those of other states. No one would dispute that the state has a duty to care for low-income residents of nursing homes, or people with serious mental illnesses and developmental disabilities. But the state’s high spending does not seem to be resulting in high quality: The average Medicare Nursing Home Compare rating for New York facilities is lower than the national norm. And there is reason for concern that some benefits, such as housekeeping services provided under the “personal care” program, are vulnerable to overuse. 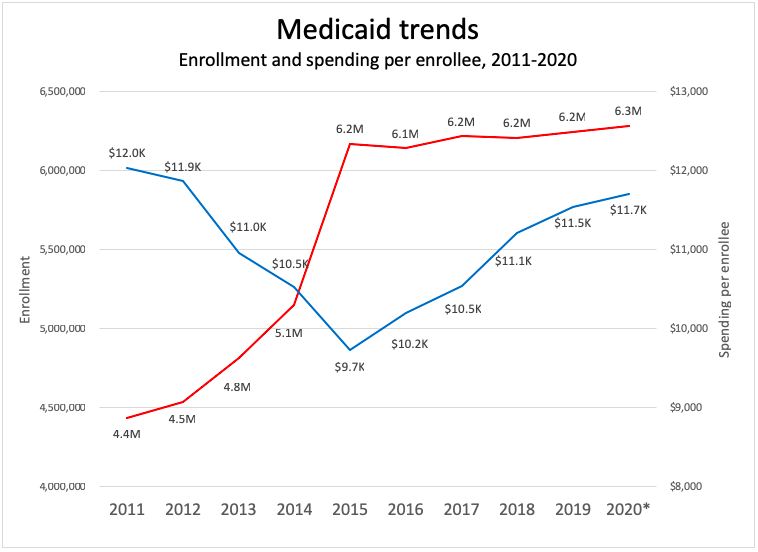 During its early years, the Medicaid Redesign Team demonstrated that it was possible to lower per-recipient spending while maintaining or improving access to and quality of care. That same philosophy should now be focused more intensely on long-term care. The governor’s proposal to establish a commission on “universal access to health care” – though lacking in detail – is worthy of support. Having reduced its uninsured rate to a historic low of about 5 percent, the state should be examining how to solidify those gains and improve on them. Table 1. Source: Kaiser Family Foundation, Centers for Medicare & Medicaid Services. Ideally, the commission will focus on practical, achievable steps rather than contemplate the giant leap to a single-payer system, which would be enormously expensive and disruptive – and unrealistic for any state to attempt on its own. The proposal to require insurance coverage for in vitro fertilization is not primarily a fiscal issue for state government and therefore should not be considered as part of budget legislation. Even as a stand-alone matter, it should be approached with skepticism. Like an IVF bill pending in the Legislature (A. 2817/S. 719), the governor’s proposal would allow no age limits on the benefit, end the existing 12-month waiting period between enrollment in a health plan and coverage for fertility services, and bar discrimination against patients based on health status. It may be unlikely that a terminally ill 55-year-old would seek IVF (or that a doctor would agree to provide it), but it’s unclear why a health plan should be required to cover a costly elective procedure in those circumstances. Should a family with four children be entitled to IVF coverage in order to have a fifth? Should doctors be allowed to implant three, four or five embryos per cycle – which improves the chances of a successful pregnancy, but also increases the risk of multiple births and the resulting complications? These and other questions deserve careful consideration. Like most such mandates, this proposal would inevitably increase premiums for the many in order to offer a valuable benefit for the few – although how much is unclear. A 2016 study in Massachusetts, which has a similar mandate, found that fertility services generally cost $4.16 per member per month – or $200 a year for a family of four. These costs would not be evenly distributed among state residents, but would apply only to those enrolled in certain state-regulated plans – adding to premiums in New York that are already among the very highest in the country. The Legislature’s bill would affect non-group, small-group and fully insured large-group plans. The governor’s version would be limited to groups of 100 or more. The state has no authority over “self-insured” large groups, which cover most people in employer-sponsored health plans. At a minimum, the Legislature should demand to see those findings before taking any action. The Legislature should also impose more accountability on the so-called Health Care Transformation Fund. As established in last-minute negotiations last year, this fund allows the governor to disburse more than $2 billion for almost any health-related purpose without consulting the Legislature in advance, or even notifying lawmakers until 15 days after the fact. The governor’s first known use of the money was a temporary Medicaid rate increase for hospitals and nursing homes, earmarked for the pay and benefits of their employees.7 The state’s contribution is to be $500 million over three years – which will be worth $1 billion in total to providers when federal aid is factored in. The only public notice of this consequential decision was a short item in the State Register published on Oct. 31, one day before it was to take effect. Why should the state subsidize the pay and benefits of some Medicaid providers and not others – such as direct-care providers serving New Yorkers with mental illness and developmental disabilities? The governor’s financial plan further reveals $888 million from the transformation fund will be spent on “housing rental subsidies,” $272 million on “state only Medicaid payments” and $180 million on “capital projects” – but offers no further detail. What, exactly, is the money being spent on? Is it appropriate to use this one-time windfall of $2 billion for these expenses, some of which seem to be ongoing operational costs? Are these expenditures consistent with the fund’s statutory purposes? Allowing the executive branch to distribute such large sums without better transparency and accountability sets a dangerous precedent and undermines the Legislature’s constitutional role. Lawmakers should seek a full accounting of all commitments made so far, and restructure the fund to assure that all state funds are properly and publicly appropriated going forward. Thank you for the opportunity to testify.